Facets are the parts of the spine that join vertebrae together and provide stability and normal range of motion. Facet joints are made of cartilage lubricated by a fluid-filled capsule that allows the joints to slide smoothly over each other. Facet syndrome develops when wear and tear thins out that capsule and the cartilage is no longer coated. As the joints rub roughly against each other, they become inflamed and irritated. Facet syndrome can develop anywhere in the spine but is most often found in the neck (cervical region) and lower back (lumbar). Facet (pronounced FAS-et) syndrome, also called facet joint syndrome, is an arthritic condition of the joints of the vertebrae. The facets join the vertebrae together and provide stability and normal range of motion. Arthritis is inflammation in the joints, and the facets are the joints in the spine, so facet syndrome is another name for facet arthritis. Facet joints (also known as zygapophysial joints, or z-joints) are in almost constant motion, which makes them especially prone to the degenerative changes associated with arthritis. Many doctors say that if a person lives long enough, facet syndrome is a certainty. Like many other joints, facet joints are made of cartilage lubricated by a fluid-filled capsule that allows the joints to slide smoothly over each other. Typically, facet syndrome develops when wear and tear thins out the fluid-filled capsule, the cartilage is no longer coated, and the joints rub roughly against each other rather than a slick glide. The joints react by becoming inflamed and irritated. This, in turn, can lead to the growth of bone spurs (osteophytes), which further limits joint movement, as well as damage to the nerves that exit near the joints. Facet syndrome can develop anywhere in the spine but is most often found in the neck (cervical region) and lower back (lumbar). Flare-ups are seemingly unpredictable, and may occur intermittently several times in a month or just a few times a year. 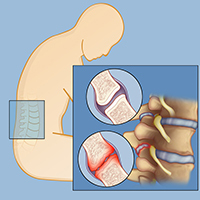 Facet syndrome strikes both men and women and is most common in individuals prone to arthritis and other inflammatory conditions, those who have had an injury affecting the spine, and in people between ages 40 and 70. Interestingly, some people can have facet joint degeneration with no painful symptoms. Other spine conditions can also complicate matters and make the pain from facet syndrome worse. Disc degeneration — a breakdown of the shock-absorbing discs between the vertebrae — can lead to extra pressure on the facet joints, which, in turn, hastens the deterioration of the cartilage. Spondylolisthesis, a condition in which one of the vertebrae (bones) in the spine slips out of the proper position onto the vertebra below it, can also add to the load a compromised facet joint has to bear.